Eaval from An Taigh FiodhThe luxurious, fully-equipped accommodation is on two floors and occupies one end of an original, architect-designed house (built 2006) with beautiful views overlooking the bay. 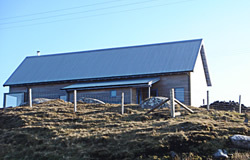 It is approximately three miles off the main north-south road through the Uists. Sunrise through mist from An Taigh FiodhThe area is rich in wildlife and places to explore, from lochs and harbours to miles of unspoilt beaches. An Taigh Fiodh provides a comfortable base to come home to after days spent walking, fishing, bird watching or just soaking up the scenery. 1 bedroom, double or twin, located in the upstairs gallery. Bed/beds have a remote control facility for comfort to sit up and read or to put your feet up after a tiring day walking. The bedroom window looks out across the loch, with Benbecula in the distance. A bathroom containing power shower, heated towel rail and plenty of storage. DownstairsAn elegant and modern kitchen facility, comprising a 2-ring ceramic hob, fridge with freezer compartment, sink and microwave - everything to make your stay easy/comfortable and enjoyable. The kitchen unit can be closed after use and forgotten about. A dining table (seats 2) is set by the window overlooking the bay. Bathroom All bed linen and towels are provided and changed weekly. There is a television supplying Freeview, i.e. all free TV and radio channels, including News 24. A selection of games, travel guides and maps is provided, together with books on local places of interest, birds, wildlife, flora and fauna and fishing. Wi-Fi is available for laptop users.